I spent Shabbat reading parts of the new Joy of Kosher magazine’s newest issue, the #IsraelIssue, which is very exciting for me: the two things I love combined: Israel & good food. Chef Adoni operates 4 restaurants in Israel, but only 2 of them are kosher. 1) Blue Sky is located on the rooftop of the Carlton Hotel, next to the Tel Aviv Marina and Gan HaAtzmaut. 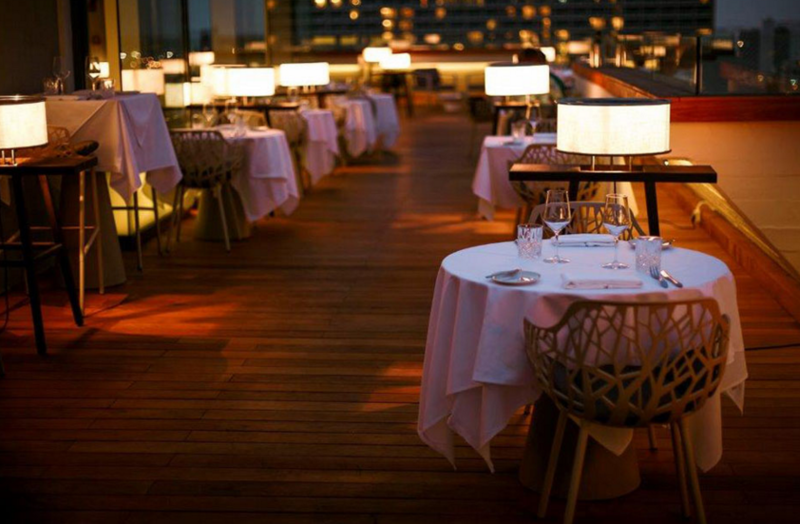 Opened in 2013, the rooftop restaurant offers sweeping views of the Mediterranean Sea and the Tel Aviv skyline. 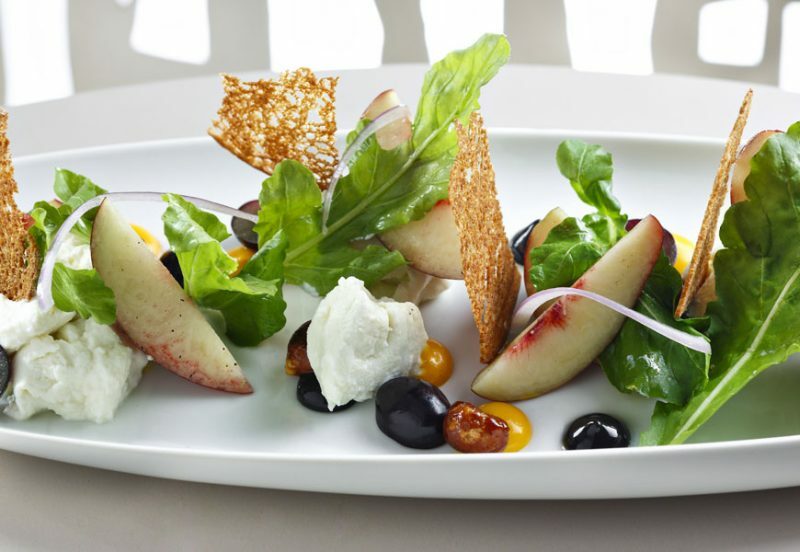 Blue Sky combines different culinary experiences, from light dairy meals with unique cocktails to a full dinner experience accompanied by Israel’s top wines. The menu, which changes on a seasonal basis, includes a wide selection of fish, vegetables, olive oil, and artisan cheeses. BlueSky offers a rich, state-of-the-art and kosher experience, ranging from small dishes beside a refreshing cocktail to a three course meal from the chef’s kitchen. Blue Sky also offers a Friday Brunch meal for 120₪ per person (some items additional). 2) Opened in 2014, Lumina is also located at the Carlton Hotel, but offers a different experience than Blue Sky. 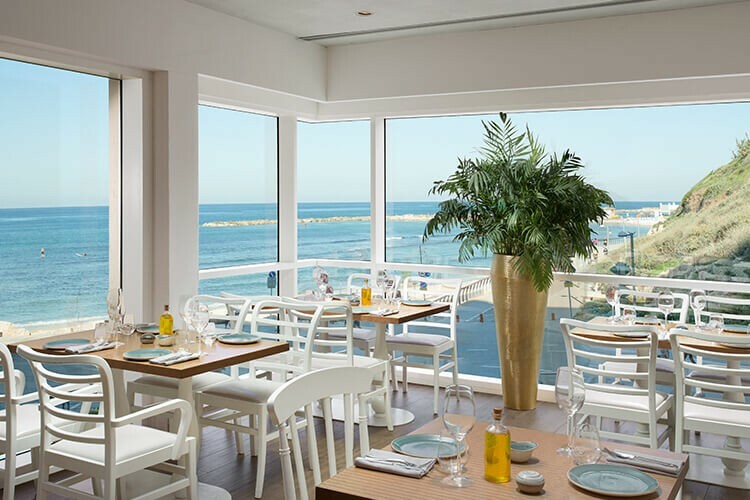 Chef Adoni’s kosher meat restaurant is a modern Israeli bistro located on Tel-Aviv’s beautiful sea front. The chef sees the restaurant’s menu as divided into three parts: 1) Jewish kitchen – Meir Adoni’s modern interpretations to traditional dishes from the jewish kitchen. 2) Mizlala – Highlight dishes from (his non-kosher restaurant) Mizlala. 3) Brasserie – Classic brasserie dishes. The restaurant looks out at a spectacular view of the beach and is suitable for either an easy going and romantic experience or a festive family dinner. While the chef does not have a restaurant there today, the Joy of Kosher article stated that Chef Adoni was going to be taking over the famous Reuben’s Restaurant, which has been around since 1973, and turning it into his own later this year. Alas, in a conversation with the chef, he admitted that the plans with Reuben’s were not completed, although he is looking elsewhere to open a kosher restaurant in London. We know that Chef Adoni dreams of opening a restaurant (or two) in the US, and it was even reported last year that he was opening two restaurants in New York. While that has not happened (yet), we have no doubt that he will and it will be worth the wait.